An award-winning smoked jalapeño salsa made with roasted tomatoes. 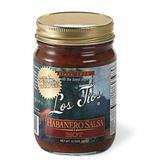 Uses: Great with any Mexican dish or can be used as a sauce for eggs, chicken and vegetable dishes. 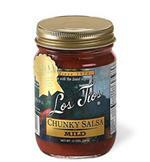 An award winning blend of chunky vegetables, peppers and Mexican spices to create a great salsa! Uses: Use as a dip or to top anything. 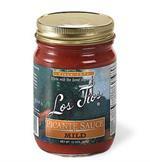 A delicious, award-winning roasted habanero pepper and tomato salsa with a unique flavor that caters to the hotter side. Uses: Use as a dip or to spice up your favorite entrée. Great on eggs and beef dishes. 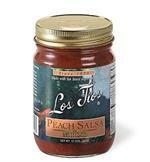 A fresh style salsa with a peachy addition. 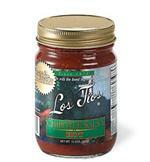 Our original house salsa served since 1970 made with a zesty blend of tomatoes, onions, jalapeños and spices. Uses: Use as a dip or to spice up just about anything. 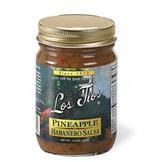 A mildly sweet salsa with a little habanero kick. Uses: Great as a glaze for ham and other pork dishes, or straight out of the jar as a condiment when something mildly sweet and somewhat hot is desired.